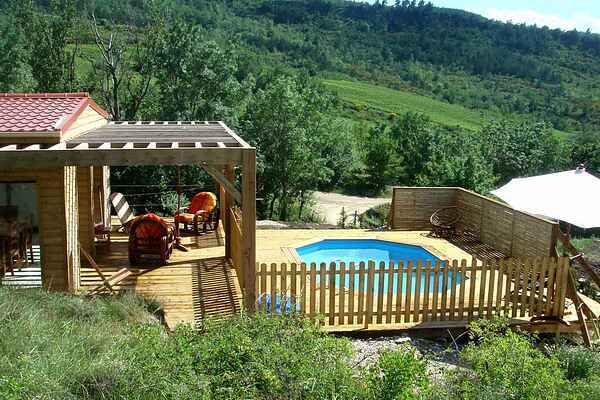 Awesome lodge in the hills of Corbières in the village Roquetaillade (5 km). There are 3 high-quality lodges(at a big distance of each other) on the domain of a renowned wine grower. So you don't have to go far for a pinot noir and chardonnay. From the lovely, covered, wooden terrace, you have a view of the kids playing in the fenced private pool, the gorgeous lush landscape of the Haute Corbières and the 11th century castle of Roquetaillade. There are several marked hiking routes in the area like the one climbing the 'Boucle de la Roquetaillade' (655 m height) and a hike to the village of Montazels (4h45). You can swim in the lakes near Arques and Puivert (21 km). Canoeing and kayaking is possible in the Aude river near Limoux (8 km). There's a park with tree climbing activities in Alet-les-Bains (16 km) for the kids, a true adventure! You can go to the bakery and grocery store in Limoux (10 km). If you want to find some culture, you can visit the impressive walled town Carcassonne (31 km), the 11th century castle in Arques (20 km), the Rennes-le-Château (18 km) (for the Da Vinci Code lovers) and the well preserved, medieval village of Mirepoix (35 km).